Jill Outside: "8,000 Miles Across Alaska"
my time in the 350-mile Iditarod Trail Invitational traveling in close proximity with Tim and his wife, Loreen. For the past few weeks, I've been finishing up the details of a collaborative book project I worked on with Tim Hewitt, a biography about his many adventures across Alaska. Like everything I do, this one is long overdue, but I'm excited to announce that "8,000 Miles Across Alaska: A Runner's Journeys on the Iditarod Trail" will be released on Aug. 18 in paperback and eBook from online retailers worldwide. For those with Kindles or related phone aps, the eBook is already available on Amazon. The eBook also can be pre-ordered from iTunes and Barnes&Noble. As of yet there are no plans to sell signed paperback copies directly, but that may change. I'm happy that this project came together. 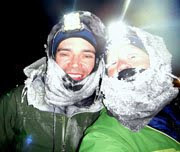 I've long been a fan of Tim's — I wrote a short letter to UltraRunning Magazine advocating for a "Performance of the Year" nomination in 2011 before we'd properly met — but never anticipated being approached to help tell his story. 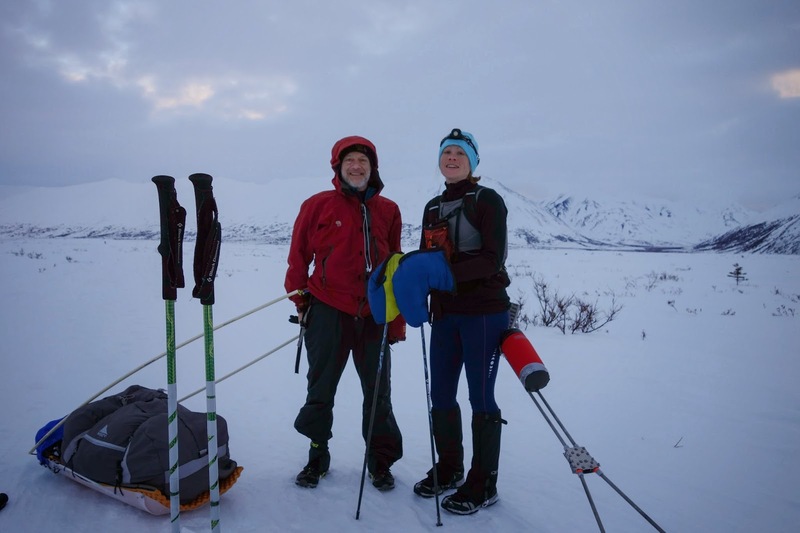 Tim has been racing the Iditarod Trail since 2000 and has amassed an overabundance of amazing adventures in that time — along with volumes of notes. Tim wanted help refining these notes into a book. It seemed like a dream project, but turned out to be quite challenging. How does one capture someone else's experiences and make them come alive? My own autobiographical storytelling is heavily based in inner thoughts, and I didn't have this luxury with Tim's book. I spent far too much time trying to develop a nonlinear storyline that just wasn't working, so I scrapped the whole thing and started from page one with a traditional timeline, keeping much of Tim's voice intact. I think it turned out well. Response has been good so far. And, if nothing else, it's high armchair adventure entertainment for the price of a few gels. The scrapped early versions of this project became the genesis for another book project I've been working on. I realized I was inserting far too much of my own voice in Tim's book, where it didn't fit. And yet I feel compelled to write about this ongoing love affair with the Iditarod Trail and the intensity of experience in winter and multiday endurance racing, and how that expands to the experience of everyday life. I know, I've written a lot about such things. I have a whole 9-years-old-and-still-going blog about such things. We'll see where this goes. But for now, this is "next project" until I can get the Ann Trason biography moving and/or light a fire under older projects that I haven't abandoned fully, just yet. 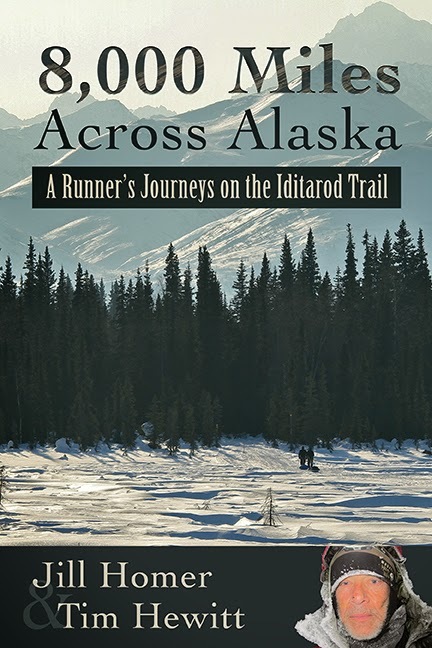 "8,000 Miles Across Alaska: A Runner's Journeys on the Iditarod Trail" will be available on Aug. 18. I will post links when it's released. Order the eBook for Amazon Kindle here. Pre-order the eBook for iPads from iTunes here. Or for Nook from Barnes & Noble here. Or a generic ePub for all eReaders here. I can't wait to download this once I get home from work! And Jill, are you planning on doing the entire ITI in 2015? Wahooo! Looking forward to it :) Congratulations to you and Tim! Just bought it on Amazon. Looking forward to it! Half way through the kindle version and thoroughly enjoying. What a story! What I meant to say: Bought the Kindle version and just finished 2001. Incredible grit and determination by Tim. Jill captures the scene,mood and adventure in words. Amazing that only 4 hardy individuals finished in 2001. Jill, finished "8,000 miles" and ready for your next excellent book!!! Question: When Tim soaked everything by sitting on his bite valve, how did he dry stuff or what did he do to continue? Wouldn't everything be frozen solid? Curiouser.